Many people in Japan use much time and energy to master English and they take the English proficiency test to prove their English skills. It should be the best for them to make good use of their acquired English skills as test examiners or for their work. 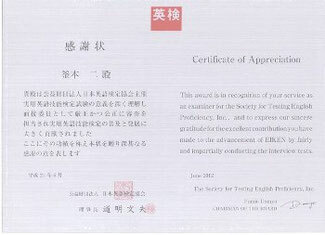 The excellent English skills are required to be STEP (Society for Testing English Proficiency) examiners, but the positions have not been opened publicly. Then the STEP 1st Graders’ Network in Japan I have been presiding can help them be the examiners and many have already been registered as STEP examiners.